A six-week expedition with Sea Education Association (SEA) to the Phoenix Islands Protected Area (PIPA) is nearing completion. This will mark the first-ever oceanographic cruise to PIPA, and is a historic collaboration between SEA, the New England Aquarium, Woods Hole Oceanographic Institution and the Republic of Kiribati. The objectives of this mission include the high-quality education of 13 students in both science and policy aspects of PIPA as well as scientific goals, which will be detailed in the coming weeks and months here on this blog. reminiscing, sharing of highlights and special memories. I’ve been thinking back to the last island we visited. Back on Nikumaroro, I had the opportunity to walk around the entire island. At times the beaches seem endless, with tall columns of hundreds of frigatebirds soaring in thermals serving as mileposts. It is difficult to choose where to look, at the brilliant white surf breaking over the reef, at the schools of fish or a passing moray eel in the crystal clear knee deep water of the back reef, or toward the island where Black Noddies, Red-Footed Boobies and White Terns nest among the emerald foliage of the trees. It is impossible, though, to ignore the refuse of the war of attrition currently being waged against the Pacific tunas. Fish Aggregating Devices, bamboo rafts lashed together with long veils of trawl nets and radio locator buoys, litter the beaches. FADs are launched into the Pacific by their tens of thousands, and as their name suggests they act as a point of interest to passing schools of fish that quite literally aggregate under them, and so provide an easier target for the purse seiners to fish around. Many of them are lost and end up all over these islands and reefs. Pago Pago is the home of two tuna canneries and the American purse seine fleet in the South Pacific; Charlie the Tuna has a statue by the main road passing the canneries. Perhaps this harbor is fitting place to end our PIPA experience. In many ways it is a good representation of the troubled relationship we in the western world have forged with the Pacific Ocean over the past three hundred years. the accumulated wealth started the textile industry in New Bedford and other coastal towns and in a way still shapes many of these places. 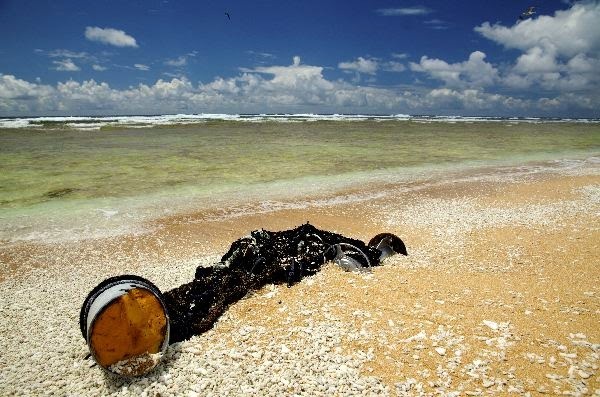 What was left in the Pacific? It took only 50 years to reduce the whale populations to a small fraction of what they once were. They have yet to rebound. The natural wealth of the ocean translocated half a world away, monetized for the benefit of distant economic actors. This pattern still characterizes our relationship with this great ocean, today the various tuna species playing the part of the whales. is within our power to catch the last fish of nearly all the tuna species. Clearly, we need a different ocean ethic to guide us to a different outcome. In late June by President of Kiribati, Anote Tong, declared PIPA closed for all commercial fishing beginning January 1st 2015. By this remarkable act, the tiny nation of Kiribati will have created one of the largest no-take Marine Protected Areas (MPAs) in the world. Now, this may sound as an abstraction, a concept somewhat difficult to get a practical handle on. If you feel that way, you are not alone. We are still trying to understand the conservation value of these large MPAs, but their true worth transcends the immediate benefit they will provide to the local ecosystems. They become focal points for conservation, places more people will visit, places of which stories are told, places that give a face to the great environmental problems facing our ocean. Places you can Google. They also become focal points for research and help inform the conversation about what we should do in the Pacific Ocean and worldwide. It has been a real privilege for us to help this process along. than an average haul! 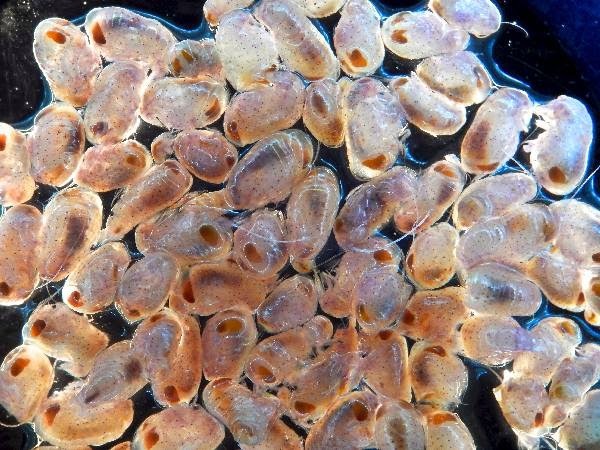 Even just as remarkable, the zooplankton we caught consisted exclusively of hundreds of thousands of just one species of an Amphipod, a type of planktonic crustacean. Why this superabundance? Why at this place? What animals are eating them and benefitting from this largesse? Is this a feature of this one seamount ecosystem or just a big patch floating by? This is just one of the many questions this voyage has produced and there are many others. The observations we have made in the past six weeks will provide the foundation on which subsequent oceanographic expeditions will build. For our part, the Seamans will be back in PIPA in 2015 to continue the work we started.